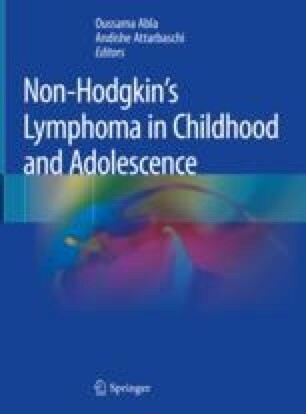 Disease-specific as well as patient-specific markers can be used for the detection of minimal disease in childhood Non-Hodgkin lymphomas. PCR-based and flow cytometric techniques have been developed for the different subtypes. The available data using a flow cytometric assay detecting aberrant phenotypes or a PCR-based method for TCR or Ig rearrangements do not allow defining a prognostic role of minimal disseminated disease (MDD) for lymphoblastic lymphoma yet. In Burkitt lymphoma and leukemia, PCR techniques on the DNA level using Myc-IgH fusion sequences or Ig rearrangements indicate a possible prognostic value of MDD in Burkitt lymphoma and early minimal residual disease (MRD) in Burkitt leukemia. MDD and MRD measured by PCR for ALK fusion transcripts are established independent prognostic parameters for patients with ALK-positive anaplastic large cell lymphoma. Validation of MDD and MRD as prognostic factors is still necessary for all subtypes but ALCL. Next-generation sequencing-based methods may provide new options for the future.